I came across this portion of a headstone in Deansgrange Cemetery in Dublin recently. The word Cabra straightaway caught my attention and so I made sure to take a photgraph of it. Also nearby is the remainder of the headstone telling of the death of Mary Elizabeth wife of the above who died on the 7th November 1918 age 90th. The original headstone is a very large celtic cross but unfortunately it had toppled down and lies broken in several pieces. The Seagrave family were the people who built the original house that in later years became the Cabra Convent. 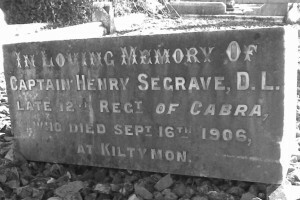 SEGRAVE, O’NEAL, Major, of Cabra, was born 31 December 1856, son of Captain Henry Segrave, JP, DL, of Kiltymon, County Wicklow; Cabra, County Dublin, and Calla, County Galway. He was educated in Belgium, and joined the Colonial Forces in 1876. He served in South Africa, 1877-8-9 (Medal and clasp); the Basuto War, 1880-1 (Medal and clasp); the Transvaal War, 1900-2; was mentioned in Despatches; awarded the Queen’s Medal with four clasps; the King’s Medal with two clasps, and was created a Companion of the Distinguished Service Order [London Gazette, 31 October 1902]: “O’Neal Segrave, Major, 18th Battalion Imperial Yeomanry. In recognition of services during the operations in-South Africa”. He served in the Great War, as Draft Conducting Officer, May 1915 to June 1917; as Town Major and Area Commandant at Brisleux-au-Mont, France, June 1917 to February 1918; as OC, VI Corps Employment Company and Commandant, VI Corps Troops, from 1 March 1918. He received the Mons Star, Victory Medal and Allied Medal. He married, in 1882, Beatrix, elder daughter of Captain W J J Warneford, and had two sons: Captain O’Neal Segrave, who served in the Royal Irish Regiment, and Captain H J Segrave, who served in the Wiltshire Regiment and was attached to the RAF.